The Z2 Disc is the premier offering in Felt’s 2015 Z-Series line at $5999, but you can find other builds for any budget starting at $799. Last month, Felt Bicycles hosted a media event to show off the brand’s 2015 road bikes (check out RBA‘s coverage here). But while all of the new F-Series, AR-Series and other lines were fair game for the consumer public, one line was kept behind a figurative velvet rope. And that line was Felt’s bread-and-butter line of endurance road bikes, the Z-Series. Now Felt has given us the go-ahead to unveil what we saw. And keep on reading for a look at Felt’s latest crop of cyclocross bikes, too. The biggest change to Felt’s Z-Series line of endurance road bikes is the addition of disc brakes-a total of three builds will have the round stoppers, priced from $1499 to $5999. ‘By and large, the Z-Series is our biggest volume seller,’ says Felt’s Road Product Manager, Dave Koesel. On the whole, the Z-Series is set apart from Felt’s more race-oriented lines, the F- and AR-Series, by a more compliance-minded construction and endurance-oriented geometry with slacker angles and more upright positioning. But Felt insists that the Z-Series is still much more than just a comfort-oriented bike. ‘It still has the snap and stiffness and low weight to be a competitive racer,’ says Koesel. In fact, Dan Martin won the Irish National Road Race Championship in 2008 on a Z-Series frame. For 2015, the frame molds for the Z-Series remain the same, but there have been some changes in construction and layup to most of the models and, of course, some of the frames have been slightly tweaked to accommodate disc brakes. The top-end Z2 Disc model comes with a Shimano Ultegra Di2 electronic drivetrain with hydraulic brakes. So what do you do when thinking about updating your best-selling product? For starters, look at the current market trends and, in this case, the market is going to disc brakes. So the 2015 Z-Series will feature several models with disc brakes, three to be precise. ‘It only made sense for us to add disc brake options,’ says Koesel. At the top of the heap is the all-new Z2 Disc, which will retail for $5999 and feature a Shimano Ultegra Di2 electronic drivetrain with an FSA SL-K crankset, hydraulic brakes and Mavic’s Ksyrium Pro Disc wheels. A non-disc version of the Z2 is also available for $4999. In total, there are ten Z-Series builds, as well as two framesets available. The Z2 Disc features a fork equipped with a post-mount disc brake design. Another highlight of Felt’s 2015 Z-Series line is the Z4 Disc model. Retailing for $2499, the Z4 Disc features the same UHC Performance carbon construction as the costlier Z2 Disc, but is built-up with an 11-speed SRAM Rival 22 group, which includes hydraulic disc brakes, as well as a set of Mavic Aksium ONE Disc wheels and size 25c Mavic Askium tires. Felt’s own components make up the cockpit including handlebar, stem and seatpost that’s topped with a Prologo saddle. Felt’s new Z4 Disc will retail for $2499 and come with a SRAM Rival 22 hydraulic group and Mavic Aksium ONE Disc wheels. Five different men’s sizes are available for the Z-Series: 51, 54, 56, 58, 61. One interesting thing that Felt noted was the brand’s utilization of size-specific designs. ‘There is a lot of talk nowadays in regards to other bike brands using size-specific geometry, tube shapes and construction,’ says Koesel. ‘But Felt has never done it any other way. Every bike we’ve made since 2006 has size-specific tubing. 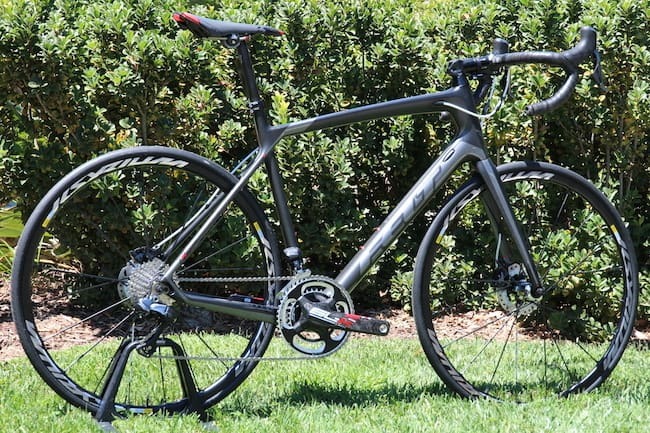 This is not a new technology, this is the way that bikes should have been made all along.’ Here’s a look at some more highlights from Felt’s 2015 line of Z-Series endurance road bikes. Felt positions the rear disc brake on the seatstay of the Z4 Disc using IS standard mounting. The Z4 Disc comes with SRAM Rival 22 hydraulic disc brakes, including a 160mm rotor on the front (above) and a 140mm rotor on the rear. Interestingly, the Z2 Disc with Shimano calipers comes with 140mm rotors front and rear. The ZW3 is the second-priciest of the Felt’s women’s line of Z-Series bikes at $2999, and it comes with a Shimano Ultegra mechanical drivetrain. A simple, straight-blade carbon fork gets the job done for the ZW3. Clean internal cable routing ensures that the ZW3’s bold aesthetics remain unencumbered. FOR MORE GREAT CONTENT, DON’T FORGET TO FOLLOW ROAD BIKE ACTION ON FACEBOOK, INSTAGRAM AND TWITTER!